All commissions are embraced with input and enthusiasm that help create something entirely unique and bespoke. 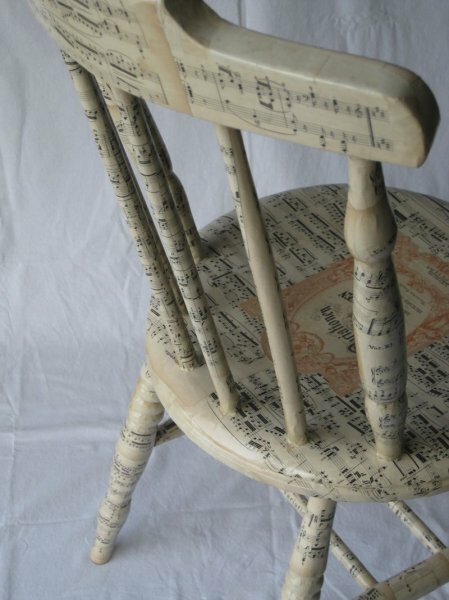 I sourced this pretty spindle back chair with its feminine shape as a a commission for a talented music student. 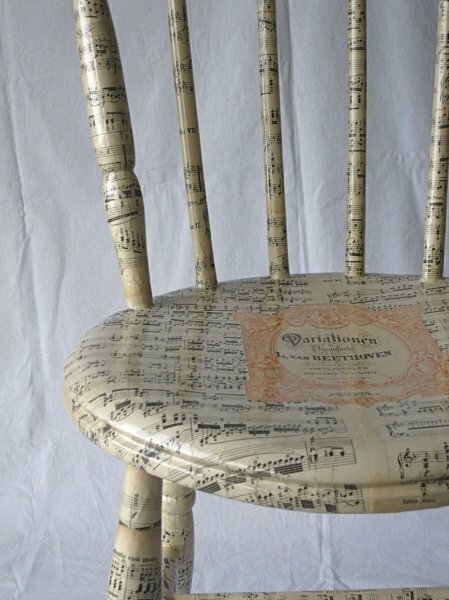 Découpaged in original vintage sheet music & many layers of varnish creating a unique & durable gift now much used & treasured by the recipient. This huge & comfy old chair was commissioned as a surprise Christmas present for a local farmer by his family who cunningly sneaked to me with a vast stack of his favourite magazine "Farmers Weekly" from which I selected my many paper images for this personalised découpage project. The chair now takes pride of place in the farmhouse kitchen where it is shared by all.....A farming family heirloom. 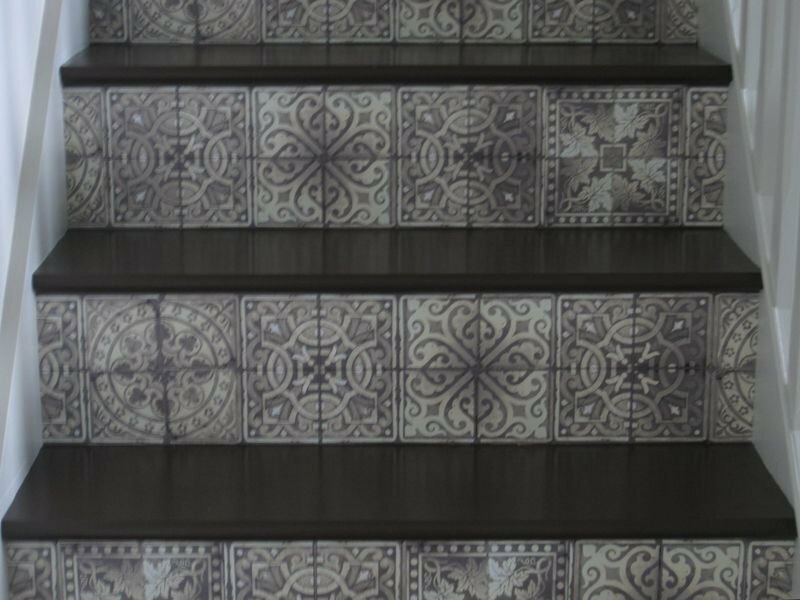 These are my studio stairs and have taken some serious abuse! And Im proud to say that they have suffered much wear & tear without a scar. 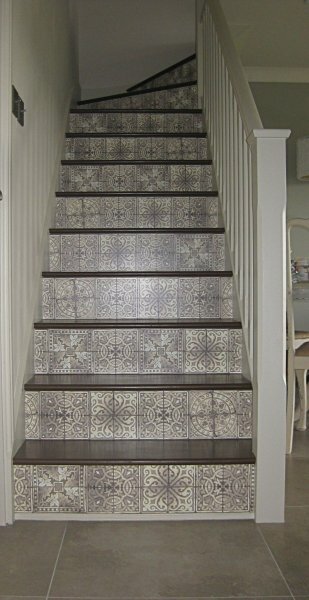 Decoupaged with hand printed paper tile design creating a Mediterranean feel. Commissioned by an Interior Designer for her own home & utilising some of her favourite saved fabric scraps. 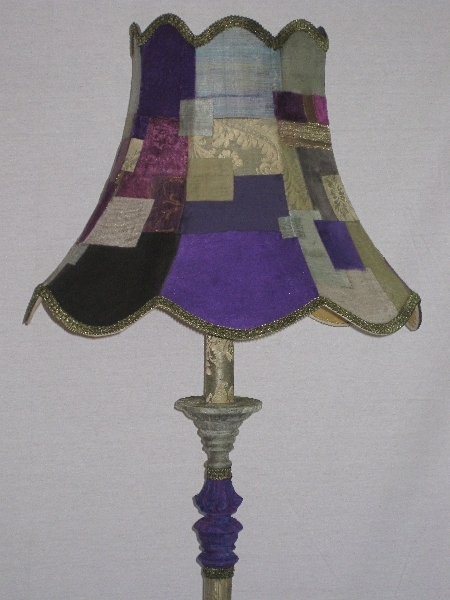 I sourced this particularly shapely vintage Lamp-stand & shade, découpaged entirely in leftover textiles creating an illuminating statement piece. 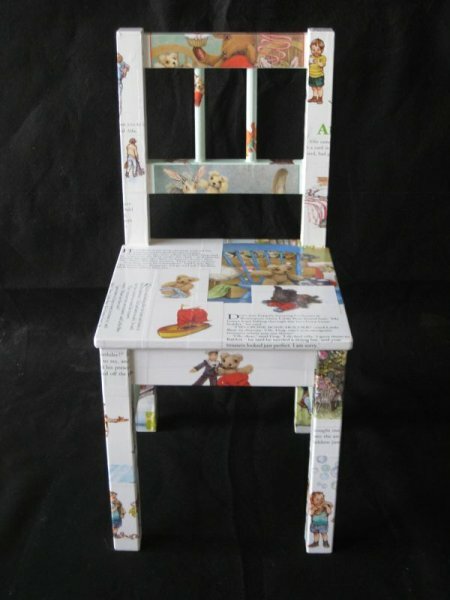 One such commission was a vintage map chair that a client wanted to gift to her husband. Creating this required me to painstakingly source old maps depicting meaningful places including his university town, Bristol, the Lake District where the couple shared happy memories, the exact district of London where he proposed to her, and the area where they have now settled to raise their family. 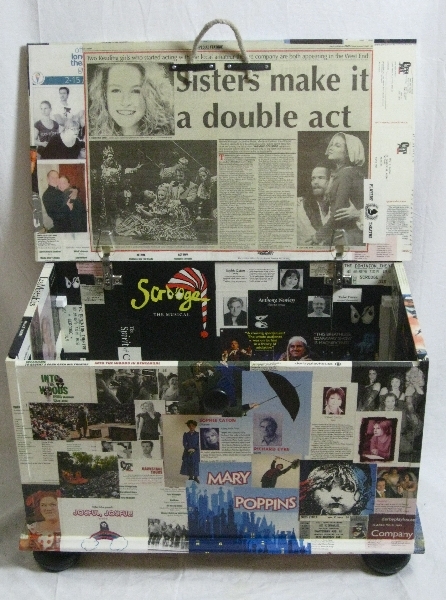 For another client with two very talented actress daughters, I adorned a pair of old storage trunks with a treasured collection of programmes, spanning decades of the actresses work. 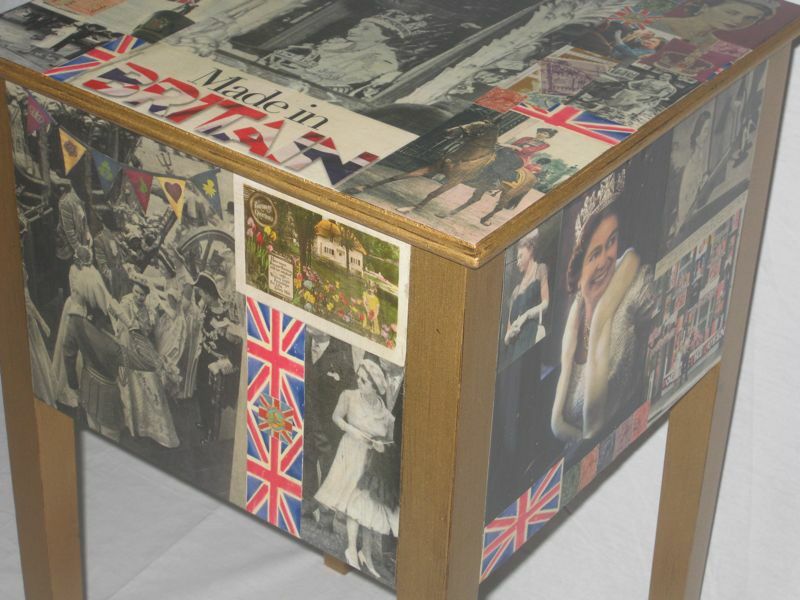 Via découpage, both trunks and their owner’s accomplishments are now preserved forever as functional pieces of biographical art. 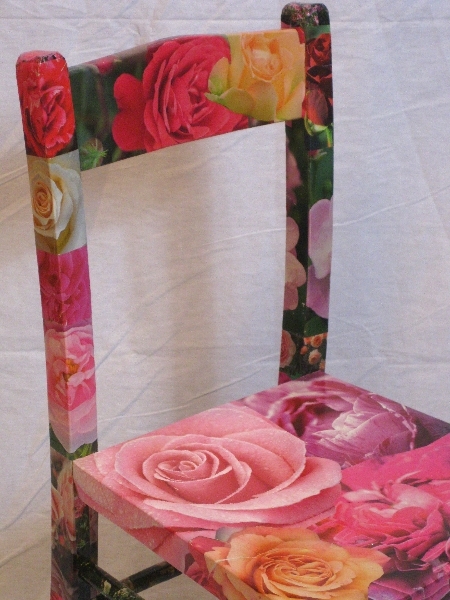 Rosie will grow up with a sweet old school chair that I covered entirely with découpaged roses. This piece is to be used and to wear gracefully with time, hopefully to be sat upon and embraced by the next generations. Julz Britannia! A recent commission for a cool chick’s bedroom. I lost count after decoupaging more than 150 union flags! 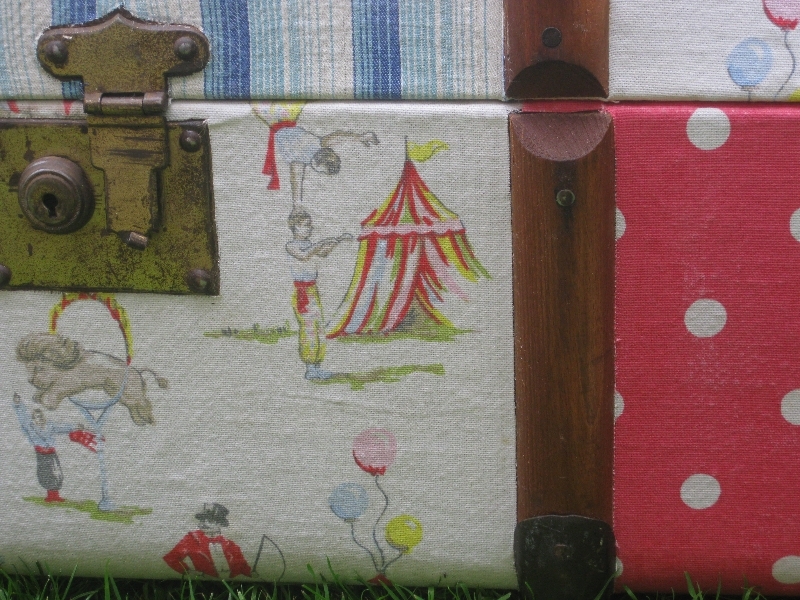 A textiled découpage toy trunk for little Noah. The possibilities are endless and the results are priceless. 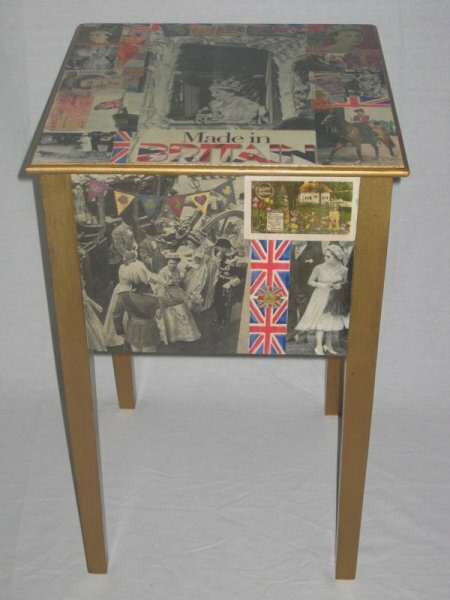 I’m about to reproduce a collection of 70’s photographs for a client, picturing herself & siblings as sweet young things with her parents adorned in the fantastic fashions of that decade; découpaged on a piece of family furniture to be utilised and glanced at with a wry smile for years to come.